Winifred Kal: Omg!!! Kylie Jenner's new red wig. Oh my!!! When I first saw this photo, I was speechless! This red wig looks absolutely gorgeous. 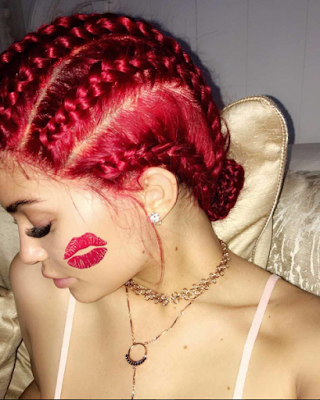 Kylie Jenner showed off her new red braided wig on Instagram. There has been a trending debate if she really braided her hair or if it's a wig. It looks like she braided her hair but if you look at it closely, you would see it's a wig, from the frontal, the baby hair and flesh tone film over her scalp. Looks absolutely great on her.